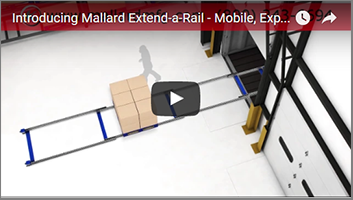 The Mallard Engineered Applications product line just got “extended” with a unique mobile, expandable pallet flow product that can go from dock staging to production/assembly… and everywhere in between. The Extend-a-Rail mobile pallet flow lane is the instant answer to effective pallet off-loading, staging, relocation and storage. It’s automation free, rugged yet simple to use, and as they say, “No Batteries Required.” This inexpensive, low-upkeep warehousing tool may be a real game changer to meeting demand for increased pick rates while keeping costs down. Imagine extending this handy pallet flow lane directly into a waiting truck and building a pallet of freshly delivered cartons in just minutes then walking that pallet out of the truck via the elongated flow lane. The forklift then easily extracts the pallets from the opposite end of the Extend-a-Rail and delivers each to the prepared storage or staging area. Extend-a-Rail is designed with separate load and unload sides so there is no interference while loading and unloading the lane. In addition, forklifts don’t have to maneuver onto and out of delivery trucks saving valuable time and resources. Once off-loaded Extend-a-Rail is then returned to the dock, moved to a new support location such as shipping or production, or simply compressed and stored almost anywhere while not in use. The Extend-a-Rail design allows for up to 10 full pallet flow lengths to be compacted as a single unit then easily expanded into a full-length push-assisted lane. 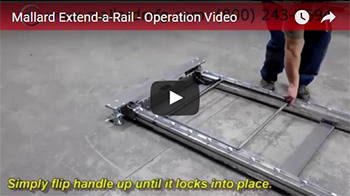 Extend as much as you need, then lock into place to secure the lane length and positioning. Pallets are loaded and walked/pushed along the durable wheeled tracks to the opposite end for forklift extraction. After all pallets are removed the lane folds back into place and with such a low profile that it can even be stored right under a row of pallet rack. So, what does all this efficiency buy? How about reduced warehouse traffic and travel time as well as increased pick rates due to faster restocking all without the exorbitant cost of fancy automation, and warehouse reconfiguring? Contact Mallard Manufacturing to speak with a gravity flow expert about Extend-a-Rail and to see if we can help you meet your fulfillment cost and turnaround goals.